The Battle of Vimy Ridge 1917. When The Great War broke out in August 1914, Canada was still a fledgling nation which had only just gained its 8th and 9th provinces less than a decade earlier in 1905, making Canada, for the first time, a contiguous nation from sea to sea. Four Canadian Divisions in line on Vimy Ridge. Though much has been made of it, the Battle of Vimy Ridge — April 9th to April 12th 1917 — was significant in that Canada fielded a full Canadian Corps of 4 Divisions fighting together in line for the first time — one contiguous line of men from nine provinces. 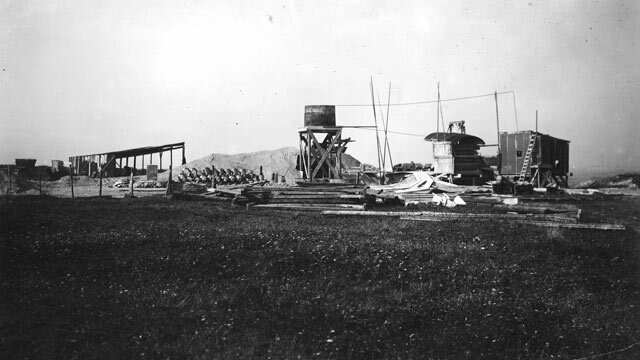 The construction of the Vimy Memorial, 1925-1936. The stunning Vimy Ridge Memorial, officially known as the Canadian National Vimy Memorial, lies atop Hill 145 on the escarpment overlooking the Douai Plain in the Pas-de-Calais department of France. In 1922, the Republic of France "in the name of the people of France" donated 250 acres of the escarpment in perpetuity to the people of Canada. The memorial was designed by sculptor and architect Walter Allward who claimed the idea came to him in a dream. King Edward VIII unveiled the memorial on 26 July 1936, in one of his only official duties as monarch before his abdication. More than 10,000 Canadian "pilgrims" made the journey for the dedication almost eighteen years after the armistice. One of the pilgrims was Silver Cross Mother Mrs. C.S. Woods from Winnipeg, who lost 8 sons during the war. The memorial commemorates the 11,169 Canadians missing in the battles of France between 1915 to 1918 and who have no known grave. 90th anniverary commemoration in 2007.